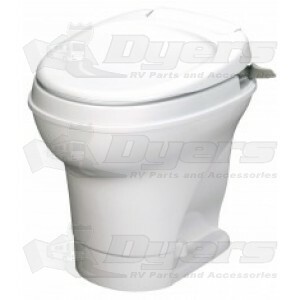 Completely redesigned to flush easier and provide full-bowl coverage. Plus, the greater height means more comfort. Attractive, economical, and easy-to-use, the Aqua Magic V is a proven, reliable performer. Half way adds water, full activation flushes. Better flush - full bowl coverage. Lightweight; easy to install, use and service. Textured lid sheds water, resists scuffs. We have had this toilet in our 1990 Motor Home that we have owned 14 years. Don't know if its original or a replacement, but you could call it, "Old Faithful." We haven't installed this yet, but it looks nice and seems to be a good value.